Congresswoman Murphy speaking with constituents at a community event she hosted in Winter Park, Fla.
Elwood Furnas, Winter Springs, Fla.
Congresswoman, today my father received his aid and attendance funds from the VA. They specifically noted your inquiry into helping him get his aid and attendance. I appreciate greatly your assistance in this matter...I believe that Representatives that help their constituents deserve to be in office. Your assistant was very helpful and explained everything to me. They provided funds back to the 1st of February of this year I will have to file some more paperwork to get the previous 7 months that he did not get his Aid and assistance for. I will let you know how that goes. Again thank you and your office for all of your help in this matter and good luck in the future. Congresswoman, I just want to express my deep thank for your help in this matter. After your inquiry on my behalf, the agency contacted me and approved my Clearance. Thank you so much for your service and we are very lucky to have a representative In Congress like you. Just a short note to thank you for your assist in resolving my issues with Loan Care Mortgage. I had dealt with them for 10 months regarding a loan modification – hurricane related – to no avail. The VA got involved immediately after a call from your office. My modification has been approved and has helped me save our home. Again, hats off to you and the VA.
P.S. God, the system works!! Ronald Ellis Sparks, USN (Ret. ), Orlando, Fla.
deciding factor in obtaining the delayed dental work that has been dragged out for those years. It is my sincere hope that the U.S. Congress will follow your initiative and leadership while addressing the problems within the VA system. I know that these problems occur all too frequently and they need someone like you to exert the leadership that’s necessary to improve the Veterans Administration...Again, Thank you. As a retired military Veteran, you may count on me to support your endeavors on the Veterans' behalf. I am 96 years old and a World War II veteran. I’ve had three surgeries on my knee and am unable to stand for more than three to four seconds at a time. I tried obtaining a new motorized electric wheelchair from the VA, but the process was difficult and frustrating. Once I reached out to Congresswoman Murphy, the VA contacted me and made the process simpler and timelier. I was finally able to get my new wheelchair. I don’t know how I can repay her for all her help, but you can be assured that she will always have my support. After my husband—a 43-year veteran—passed away, our family struggled to receive the VA benefits we had earned. Before he passed, he told me that Congresswoman Murphy would be able to help me. I know it’s not easy to deal with the VA, but the congresswoman’s office was able to work with them, and delivered! I’m thankful to have Congresswoman Murphy representing me in Congress. Mike Pasayan, Lake Mary, Fla. The personal tour of the U.S. Capitol provided by Congresswoman Murphy’s office was the highlight of our visit to Washington, D.C. The U.S. Capitol was magnificent, but the knowledge and enthusiasm of Congresswoman Murphy’s team made the experience unforgettable. My granddaughter is an American citizen who lives in Ecuador and recently had a child. I wanted to ensure that my great granddaughter would be an American citizen as well. Because of Congresswoman Murphy’s intervention and communication with the U.S. Embassy in Ecuador, my granddaughter was able to receive her child’s certificate of foreign birth. I am so happy to have that hurdle behind us. The Congresswoman’s office was so efficient and helpful, and we are grateful for her representation. My husband had issues replacing his Green Card. It was sent in the mail to the wrong address so we never received it. We tried getting a replacement card but USCIS wanted us to pay $455 for the new card. Congresswoman Stephanie Murphy stepped in and was able to have the card sent to the correct address. We are extremely thankful to the Congresswoman for her help! My health care business relies on timely payments from insurers and Medicare to cover expenses, pay staff, and treat patients. An administrative error resulted in a three to six week hold on Medicare payments to my business, which would have ruined us had Congresswoman Murphy not intervened. She worked with Medicare to resolve my problem and we continued to receive payments. Thanks to her prompt response, I was able to continue paying my employees and treating our patients. I am convinced this process would have not ended so quickly without the help of Congresswoman Murphy. Geoff Rogers, Winter Park, Fla.
My family and I recently took a tour of the U.S. Capitol. Everyone we interacted with was amazing. Congresswoman Murphy's staff was positive, professional, and helpful. Stephanie is making all of us in the 7th District proud! I want to say THANK YOU to Congresswoman Murphy for the amazing tour that her office provided to our UCF cheerleading team. I think by the end of it we were all almost speechless. The kids just kept remarking after the tour about her staff’s deep knowledge and passion. The way the congresswoman’s staff spoke about current national issues, like racial tension and gun reform, was bi-partisan, insightful, and right on the money. The tour was the highlight of the day, and a great way for us to start off the weekend before a big win. After hurricane Irma, I was without power for five days. Luckily, I had family that I could stay with. I’ve lived in Florida since 1981 and have seen my fair share of storms come through both coasts of the state. After the dust had settled and life started to get back to normal I received a flyer in the mail from the office of Stephanie Murphy. This flyer contained information about disaster relief as well as information regarding disaster loan assistance. There were no giant pictures of the congresswoman on the flyer in an attempt to capitalize on face time with citizens during a difficult time; but rather information, websites, phone numbers, and maps that so many people require after a hurricane. Congresswoman Murphy stands for what I believe we need in government: transparency, communication, and trust. Donna Wood, Winter Park, Fla.
My husband was a veteran of the Marine Corps. When he passed away, I had trouble accessing VA survivors’ benefits and ensuring my husband would be buried at Arlington National Cemetery. Congresswoman Stephanie Murphy worked with the VA Office of Survivor Assistance so that my husband could be laid to rest at Arlington alongside others who served our country. Thanks to her work with the VA, I was also able to get my survivors’ benefits promptly. Jerry Fox, Altamonte Springs, Fla.
As a veteran, I count on the healthcare provided by the VA, but because of issues with my eyesight, I cannot drive myself to the Orlando VA Medical Center. I contacted Congresswoman Murphy and let her office know that I needed help getting to an upcoming appointment at the VA Medical Center. They took care of everything. In less than 24 hours, Congresswoman Murphy worked with the VA and arranged transportation to and from my appointment so that I could get the care I needed. I really appreciate Congresswoman Murphy's help. My dad served in the Air Force for 21 years. Our family has always been incredibly proud of his service. When he passed away, my mom struggled to collect the benefits he earned. 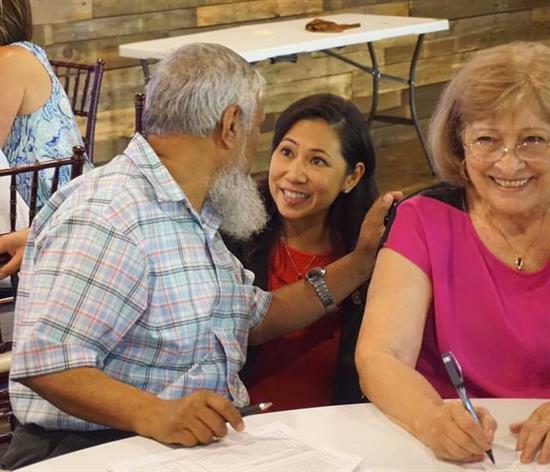 After waiting more than a year for the VA to process her claim, we decided to reach out to Congresswoman Stephanie Murphy for help. Congresswoman Murphy immediately got involved and fought to resolve my mom’s claim in less than a month. My mom was finally able to access her VA benefits. I'm so grateful to Congresswoman Murphy for being a champion for military and veteran families.